When could, would and should you replace tubes? Some guitarists religiously replace the tubes in their amps every two years; others never do so, or not until the amp takes a vow of silence. The two camps don’t exactly see eye to eye, and their preconceptions and differences of opinion are fuel to the flames of debate raging in many forums. We’d like to shed a little light on the topic to banish the darkness from the great tube-swap controversy. So does it pay to regularly swap tubes? Playing guitar at home has never been as convenient, rewarding and motivating as it is today. It’s always been a treat to revel in the sonic glory of bona fide tube-flavored tone. Now, though, thanks to innovative technology we can do this even at low volumes in the comfort of our cribs. Some modern-day tube amps deliver stunning sound at low wattages. And if they’re equipped with a power soak, a circuit like the TSC to protect tubes, and a DI out such as the Red Box, they offer reliability, utility and outright convenience few would have thought possible just a few years ago. This all adds up to countless hours of bliss for guitarists. But the clock is ticking, and sooner or later some will begin to ponder how much life is left in those tubes. So let’s talk about how many operating hours of rocking good fun you can expect to enjoy and when it’s high time to retire your old tubes. Many tube amp owners, unaware of the facts, are overly cautious, guarding the heart of the amp – the power tubes – like a mother hawk watching over her eggs. Tubes are not as fragile as eggs, but like hatchlings, they do need some tender loving care. A little healthy curiosity goes a long way: It behooves guitarists to learn more about tubes so they can do a better job of looking after them. As discussed in the VTI blog post, tubes – and those big power tubes especially – are exposed to heavy electrical, mechanical and thermal loads. If you’ve ever touched a working tube with your bare hands, you’ve felt the truth in that. Any component that takes that kind of battering is not going to last forever. It will have to be replaced eventually. The consensus among connoisseurs of tone is that a creeping deterioration of the amp’s sound sets in as soon as tubes are past their prime. First let’s debunk some of the myths. There’s no voodoo at work here. Good tubes may get your mojo working, but swapping them when they’re on the brink of zombification – the lights are on, but nobody’s home – won’t mess with your juju. The facts aren’t easy for some of us to face, but in the sober light of day our beloved tubes are just wearing parts like the brake pads of a car. Most of us don’t cling to those for sentimental reasons; we change them when the sparks start flying. On the other hand, aging tubes are not the tone-sucking demons that some people in many forums make them out to be. 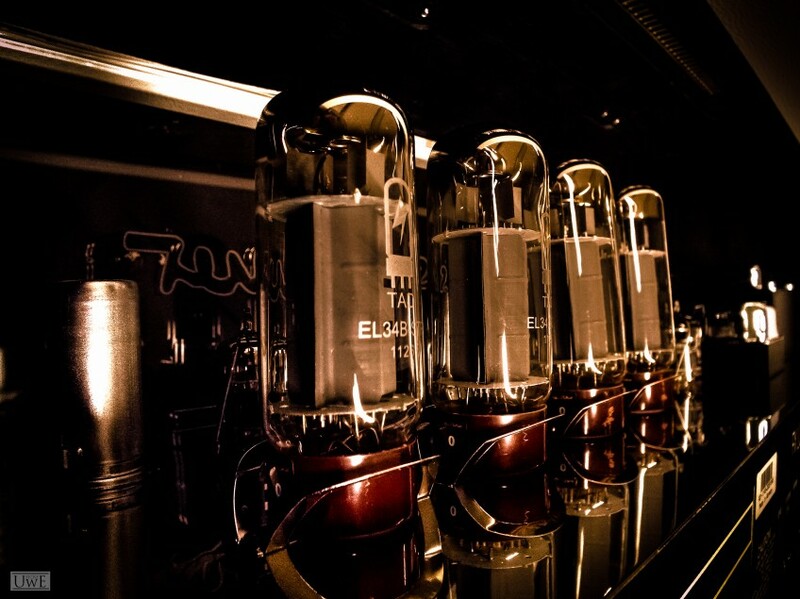 The tubes in an amp live shorter lives than semiconductors. That explains all those sockets in the chassis. Guys and gals who earn their living with a soldering iron will tell you that hardwiring tubes into the circuit would be a much better option if technical concerns alone mattered. Better, yes; feasible, no. Swapping tubes with a hot soldering iron is not the sort of pastime most of us envision for ourselves. But I digress. You may find it reassuring to learn that there are tubes that do their job without complaint for decades, so most concerns are unfounded. And with a little background information, you’ll know all about the few truly important criteria that prompt a tube change. The first criterion is a tube’s maximum life expectancy. Even the most mathematically challenged player should be able guesstimate how much of that life has been expended. We’re not talking about the shelf life of a perishable item here. The only thing that matters is how many operating hours it has put in, and not how many years have passed since it what was made. 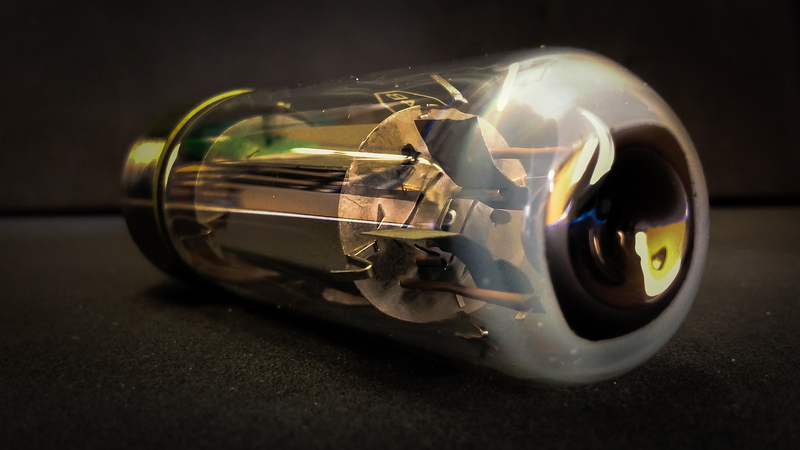 You can expect a conventional amplifier tube to have a service life ranging up to 10,000 hours. Tubes with military specifications are built to last up to 100,000 hours. How do you know if you’re looking at a military-grade tube? You could say that the type designation made a military maneuver and shifted to the right flank: ECC83 is the designation for the regular civilian tube; E83CC denotes the military version. Two rehearsals a week lasting two hours each + two gigs a month lasting three hours each = 22 hours of operation a month. Let’s round up to 25 hours a month just because we like to play. 12 x 25 = 300. Now we have a rough idea of how many hours a year those tubes get toasty. The 10,000 hours of expected tube life is of course an estimate, but not an unrealistic prospect. If we divide this life expectancy by 300 hours of service a year, we get a useful life of 33 1/3 years. Now that has to come as a big surprise. And what’s even a bigger surprise is that some tubes whose life isn’t cut off prematurely by some unexpected mishap or malady actually gets the job for that length of time. Even if we take the pessimistic view and say our tubes are only going to hold up for half that time, we’re still talking about fifteen years. Yes, some tubes fail much earlier than that, but many indeed last that long. That’s a number most of us should be able to live with. The bottom line is that tubes are far more reliable and faithful companions than their reputation would lead us to believe. So while some may practice premature tube replacement as a precautionary measure or to tweak their tone, it’s only a technical necessity when the tube is ailing or failing. This is why it’s not unusual to come across fellow travelers on the road toting amp heads with their original ‘60s and ‘70s tube complement intact and still sounding sweet. What’s more, we’re talking about power tubes here. Preamp tubes are more compact and don’t have to work as hard, so they tend to last even longer, or seemingly forever if you’ve been waiting for them to go bad so you don’t need any excuses to try a new set. So when does a tube swap become a necessity? The most compelling and immediate criterion for tube replacement is any corruption of the tube’s vacuum simply because the consequences can be dire. This corruption can be slow and insidious as is the case with thermally induced hairline cracks or as abrupt as a burst or broken glass envelope. Both cases are extremely rare and usually occur in tubes that have some previous damage or are subjected to extreme mechanical duress, for example, when your well-meaning buddy drops your amp. You can determine if the vacuum is intact by examining the getter – that’s the metallic-, chrome- or silver-colored layer at the top of the tube – to check if it’s milky or discolored. If you spot discolorations or see that the entire top of the tube is stained with a milky coating, than air has entered the tube. It is defective and must be replaced. The second case that would make a tube swap at least worth considering has to do with dirt and residue sealed inside the tube when it was made. They can be time bombs that upend gigs with their nasty surprises. If you’re lucky, these particles will at some point be burned in place. On a not entirely unrelated note, the VTI system does this automatically while tapping the tube, which is why Hughes & Kettner tubes are safe in this regard. If foreign matter is burned in, the tube will be reliable and you will on the safe side. If not, the worst case is that it will short-circuit and silence the amp. Incidentally, this explains the oddity of all-tube amps failing either very early or not at all. Loose particles in a tube can be a problem for a new amp, but they’re usually burned in place during the first hours of operation. They will no longer be an impairment once they’re fixed in place and the life of the tube will vary only slightly from that of a pristine tube. Wear, oxidation inside and aging are the logical consequences of operation. They can be detected, but their effects are not nearly as audible as is commonly believed. The degradation is gradual and very slow, so the sonic consequences are going to be difficult if not impossible to discern, at least in the early stages. So if concerns about the life of a tube have been keeping you awake at night you can rest easy now. They do tend to last longer and operate more reliably than some would have us believe. Defects occur either very early if any residue inside is not burned in, or when they can be expected to occur because the tube is approaching the end of its service life. Problems with the vacuum inside the tube are extremely rare. Swapping tubes before their time is a fruitless exercise unless it’s done to change the amp’s voice. And if your amplifier is equipped with device like the TSC module found in Hughes & Kettner amps, then it won’t even need biasing after new power tubes have been installed. If it lacks such a device, you should leave the task of swapping power tubes to professionals who can also match them and bias the amp properly. We hope this news dispels all the concerns about tube’s reliability and any maintenance related anxieties. All-tube tone is not some luxury for a select few to enjoy. It’s there for everyone, even technophobes, to take pleasure in. First published: May 23 2014. Most recent update: December 22 2016. Any recommendations for swapping out power tubes in my tm36? I’ve just replaced a CM1 valve in my tubeman mk1 with a JJ ECC83S and the new valve blew straight away. I’ve put back the old CM1 valve and it still works but is very quiet (reason why I changed it in the first place). I don’t really want to spend on another ECC83 if that’s going to blow again. What could it be? Today’s tubes only seem to last about a year or so. The SEDs were great but they’re no longer made. Hello, After searching on the internet, I finally found your address. I wanted to ask you a question, please. Is it normal for the Tubemaster deluxe 40 amp head to go off automatically after a few hours? To save power, AES turns off the amp after 90 minutes of inactivity. To turn the amp on again, you just need to turn the Power and Standby knobs off and on again! It is also possible to disable AES, so the amp won’t automatically switch off – find out how to do that in the manual. Hi guys! I just purchased a used Access Tube pre-amp (used of course). I just love it and find it to be a awesome sounding pre-amp with all the features I had with a modern “modeler” which is saying a lot for a pre-amp that is over 20 years old. I asked the original owner if he had ever re-tubed. His answer was no. I read this article and yes, it was helpful but even at that expected life I’m coming up to the end on this units tube life so I’m going to try a set of Mullard’s. I do have a few questions about setting up the midi operation and if the unit I have can be upgraded to V 2.0 and the B sound module. Can some one help me with that or is this no longer available? Hey there Johnny, great score! The Access was (and still is!) a beast of a preamp. Hmm, because the Access is so old, we’d recommend you contact the H&K service techs directly on service@musicandsales.com – they’ll have all the old documentation and may even have spare bits and pieces as necessary for you! We’re hopeful you’ll be able to do the upgrade somehow! I run an electronics repair shop here in Maine, and have come across a combo that fits into this discussion. It produces a funny sound all on it’s own, even with no signal input. I even removed all the preamp tubes, and the noise continues. Come to find out, the EL34 output tubes are PHYSICALLY vibrating! So, indeed, when the guitar plays a certain note that is the resonant frequency of these tubes, they vibrate, being exposed to the sound waves from the back of the speakers. Further, the tubes are mounted on a suspended circuit board, which also vibrates along with the tubes! A poor design, in my opinion. Had I been the designer, I would have mounted the tube sockets on a secure metal chassis. Also, tubes in combo amps will get slammed with the sound waves that fly out of the speaker….I never thought of that….sound moves forward and backwards from the speaker….and in most combo amps, the power tubes are just hanging there, getting hit with the back waves from the speaker. I put a cardboard shield between the speaker and the tubes, so they’re not getting hit so much…..I would think that would also extend the life of the tubes. Interesting points Mark. There’s very little out there in terms of studies that have been done about that, so we can’t say with certainty – we’ve never tested it properly either! – but many guitar players are of the feeling that tubes have a harder life in combos than they do in heads… Would be fascinating to actually do some kind of test that could accurately state if there is a significant difference, although tubes being the unstable and unique things they are, that’d never be 100% scientific. Hi Hughes and Kettner blog! I was thinking about changing the stock tubes in my Tubemeister 18. What preamp 12ax7 tubes would fit best in my amp? I am a versatile player but i usually lean to the clean side. Im looking for more headroom to help me with my live gigs when I perform in smaller venues and when I dont have the luck of having a PA system. Hi Dominik. Well, the best thing to do – if you can – is find a local tube tech and try out a bunch with him/her. That’s the easiest way to find what works for you! After all, tone is purely personal. 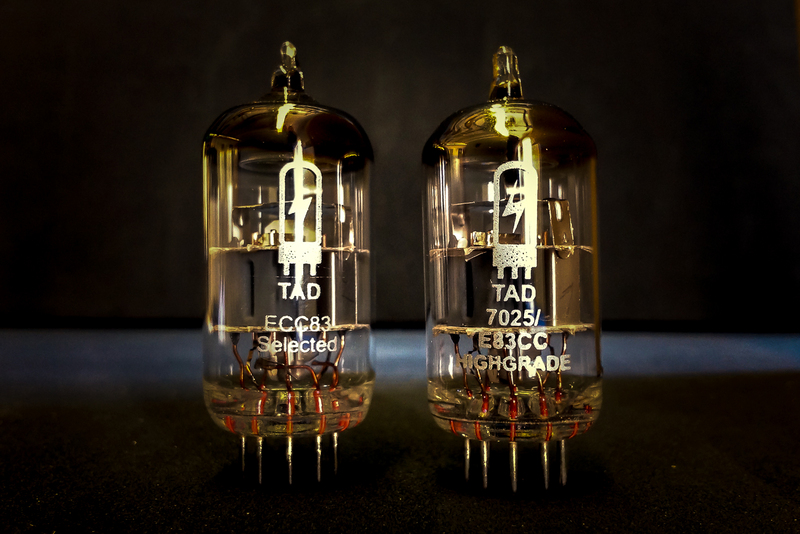 However, you could also think about lower gain preamp tubes like 12AT7s or 12AY7s – it’s just a good idea to test them before deciding whether to go for them or not, because they will alter your tone. However, if you want the amp to stay clean longer, they could be right up your street! Hi! Great info! Could you help me a bit? My 6-month-old Tubemeister deluxe 40 is acting out. It makes a similar sound to a broken potentiometer but it makes it all the time. I’ve tried it with no other cables connected but the power and the speaker and also with the speaker muted and the sound going to my studio monitors and it’s still there. So the problem is in the amp. I read somewhere that it could be because of the tubes. What should I do? Will it go under warranty? I haven’t knocked it around, I’m sure of that. Hi Jukka, thanks for writing us, and we’re sorry to hear you’ve had this issue. The good thing is, you’ll be covered under warranty, so please just contact the store where you got the amp straight away and they’ll look over it for you to fix the problem. It could indeed be a tube issue, but we can’t really make the call without having the amp in front of us to test, unfortunately. We hope this helps, and good luck 🙂 Let us know your progress, and hopefully you’ll have a working TubeMeister Deluxe again soon! This is a suitable replacement for any 6HU8=ELL80 Twin Pentode tube type. Various brands available. Details Add to cart”. What do you think? With tubes we always say if it will fit in your amp, try it, and if it sounds good to you, keep it 🙂 We’ve never tried Ultron tubes, so we can’t make a comment on that exact brand. We also Googled them and there’s not much info around, so maybe call the store and ask them for their expert opinion! I have an old Fisher. It has two tubes (6HU8) a right and a left PUSH PULL POWER OUT. When I got it the right tube was missing. Should I replace them as a match set? Thanks for the great article on tube lifespans. It’s a concern that has been niggling in my subconscious for awhile, and now I can put my incipient paranoia away until something else triggers it. Thanks again. hey just wondering…what do you mean by “qualified tech”..like if i bring it to the guitar shop is that acceptable or is there some sort of hughes and kettner certification they have to have? ?….what proof do i need that it was done by a qualified tech?? also i bought a grandmeister36 and am enjoying it…the only thing is i find the disortions are a little “harsh” and have been told and read the jj’s el84’s and the jj goldpin ecc83’s remedy this……do you guys have any suggestions as to what make good replacement tubes…..and do you find that different tubes cause a noticable difference in the performance of this amp??….. Hi Matt – by qualified tech we normally mean a tech who’s taken a course/studied in the art of being a tech. There’s no specific qualification we look for, but it could be an apprenticeship, or a BA in something relevant, whatever. Of course, a registered H&K dealer will be the best place to get an H&K amp looked at, as techs there will have been (or should have been!) schooled in our amps. If you’re getting work done, just make sure you have a written note of it. Very insightful. My tubes are staying in. Good decision Steve, and thanks for the kind words! This a great article. It does show there is an awful lot of snake oil talked about valves on forums. Just to confirm, if you did want to change the valves on a TM 18 for a different voicing, you could do this yourself, because the TSC module re biases them, or would you recommend a tech? Hi Craig, and thanks for the kind words! We would always recommend a tech do a job like this – TSC just spares him/her the rebiasing job that would need to be undertaken with other amps. One key reason for this is that as soon as you open up the amp, the warranty is voided. This is only not the case if you’re a qualified tech. Hi, my name is Patrick. I have a tm 18 head and wanted to switch the preamp tubes but cannot find an answer anywhere online on where the v1 and v2 tube is located at. Is the v1 more toward the power on and stand by switch, or is the v1 closest to the imput jack? Thank you. You wrote: “The 10,000 hours of expected tube life is of course an estimate, but not an unrealistic prospect.” I hear this estimate tossed around the internet regularly (usually between 5,000 to 10,000 hrs.). However, I’m not able to find many reputable or legitimate experiments regarding power tube life expectancy that I trust. Will you please let me know if you know of any such studies that have been conducted? I’m looking for something done independently; not related to any tube manufacturer or anything posted on a blog. Thanks for the article. It was very informative. Hi Jeffrey, and thanks for your question and kind words on the article. Hmm, we actually based this on our own experiences of R&D/playing with Hughes & Kettner (and other amps!) down the years. We’d also very much like to see some less-biased studies done on this, although we suspect that the general internet consensus is correct, given how most people seem to be roughly in the same ballpark. Ultimately, though, there are so many factors that we’re all measuring differently: tube types, how much usage and under what conditions, when we decide it’s time to replace a tube, etc., that this might be difficult! Great article and I’ve bought some alternative tubes, but how do you physically get to the tubes in a Tubemeister 18 Twelve combo? Hi Rich. Hmm, getting into the combos is simple in theory – just unscrew the back panel and take it off. It’s not stuck or glued in place, but it’s very snugly fitted, so may require some considerable elobow grease to remove! With most amps (including older H&K models that predate TSC), power tubes do need to be biased before you put them in. I changed the tubes of my Grandmeister for 2 pairs of Sovtek El84. And after one year and a half of use I was playing, heard a weird sound and saw a light in the amp. I checked the TSC and I had the first tube to be replaced. So I changed n1 and n4…but now when I check TSC that pair is not biased equally. Thanks, You’ve answered a few questions about ohm’s and tone. Very helpful! Thanks for this advice, I was under the impression that gigging for a year meant that I would have to change my valves now. I tried changing the valves on my 100w TSC switchblade, did a gig and thought not much difference to be honest! Reassuring advice on the subject. What about replacing the speakers? if the speaker is not broken or makes a strange rattle noise, you will never need to replace it. Especially Guitar Speakers can work for a lifetime if you take good care of them, just keep them away from moisture. This is a really great article! Thank you for the insight. 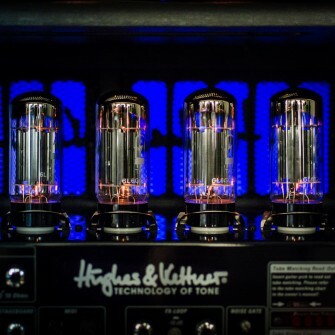 Question: with which brand of tubes does H&K stock and ship their amps? The EL84 we get directly from Chinese and Russian manufacturers, so they are not branded, but tested and selected by us as well. This is most interesting as I am sure that most of us know very little about tubes and valves as, apart from amplifiers, most of us never come across these mysterious relics of the past. On question of when should we swop our tubes, I have problem with my Tubemeister 18. When I turn up the volume it starts have momentary dead spots in the sound. For just about a second, the sound cuts out when I am playing lead solo and then comes on again. At the same time, the orange glow, always in one particular larger tube at the back, dims and then lights up even more brightly, accompanied by a resumption in my sound. Do I conclude that the valves must be swapped ? If so all of them or just the one that dims and then lights up intermittently ? Two different technicians cannot fix. One suggestion is that the power supply might be defective. If I play at low volume there is no problem. Any suggestions ? It is difficult to find a really knowledgeable technician in Johannesburg. this really looks like either the tube is damaged and has to be repalced or it is just not sitting correctly in its socket. Please check TSC on the back while you are not playing. The LEDs should be off, otherwise the tube has to be replaced. To check zhe sockets, just let a technician swap the tube 1 to socket 2 and tube 2 to socket 1. Does the flash stay with the same socket or the same tube, or is it gone? Most dealers sell matched pairs of tubes, so we suggest to get a new pair and keep the one tube that does not cause flashes as a spare. You can use all kinds of EL84 as a replacement. The original tubes come from China and offer the widest tonal range, if not available you can as well use Russian tubes with a more classic rock tone.